Not everyone can undergo tattoo removal. If you have reached a point where you are sure that you finally want to have your ink erased, then you should know about tattoo removal contraindications before proceeding. First of all, if the area of you tattoo is inflamed, injured, or sunburned, delay the procedure until such time that the skin has healed and recovered completely. People with undiagnosed lesions, weeping acne, warts, and rosacea should not have a removal treatment on the affected area. Pregnant women and those who are trying to conceive are generally not recommended to have tattoo removal procedure. Although unverified, there is a possible risk of ink transfer to the fetus. Because the process can be painful and uncomfortable, pregnant women should delay having tattoo removal since the stress can add to the factors that can cause miscarriage. 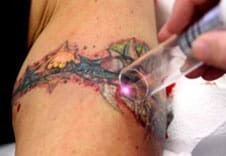 Those who are undergoing chemotherapy are likewise not suitable for tattoo removal. They are at greater risk for infections and skin changes. Minor skin problems are also common such as rashes, itching, peeling, redness, dryness, and increased sensitivity. Another group which are not suitable candidates for tattooing and tattoo removal are those with a history of keloid scarring. If you must have your tattoo removed but are prone to keloid scars, be sure to choose a practitioner who is highly skilled and experienced in this field. People with a history of hyperpigmentation or hypopigmentation are not good candidates for tattoo removal. Although rare, there are instances wherein there could be increase in melanin pigments, leading to hyperpigmentation. On the other hand, a decrease in melanin leads to hypopigmentation or lightening of the skin. This is generally irreparable and permanent condition. People who have badly controlled diabetes are generally not advised to get a tattoo as well as have a tattoo removed. Diabetics are especially prone to uncontrolled bleeding, blistering, and infection. To prevent or minimise the risks, maintain a controlled glucose level and coordinate with the facility regarding safety precautions. These are the basic things that you should know about tattoo removal. Some of these are not absolute and the risks can be avoided. You can delay the procedure, practice extra care while having it done, and make sure that you observe good tattoo aftercare.